An I-Power School of Gymnastics Birthday Party combines a safe, clean, bright facility, and highly trained instructors, with the fun and flexibility of a structured birthday celebration! RESERVE YOUR PARTY DATE ONLINE NOW! Choose Bronze, Silver, Gold or Ninja then choose add-on options. * We do all the clean up! * Tell us your theme! We will customize tablecloths, paper products and games to match. * Specialized Ninja Themed! Ninja tablecloths and paper products. To make your party planning as easy as possible, you can drop off all of your supplies, and we offer to do the set-up & clean-up! That’s right, WE DO THE CLEAN-UP! Ages 1-5 years old! 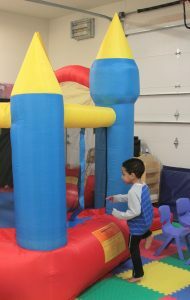 Party time starts with 60 minutes of structured playtime and 30 minutes of celebration time. Includes a bounce house, birthday t-shirt, tablecloths & paper products (choose 1-2 solid colors) juice, and an I-Power water bottle with goodies for all the party kids. Note: All guests playing on equipment must be age 10 and younger. *Please note that during winter months our parties book about 2 months ahead of time. Please plan early! *A refrigerator and freezer are available for drinks/ice cream 1 day prior to the party. 1 hour of play in the gym including a warm-up, obstacle course, tumble track, trampoline, in-ground pit, rope climbing, parachute, and relay course! ½ hour of celebration. You may supply us with the all of the decorations prior to the party or bring them with you and we will do the decorating and set-up for you! An I-Power t-shirt for the Birthday Child! Treat Bags or I-Power Water Bottles filled with a few treats and a free open gym coupon for each Party Guest! Payments can be made online, over the phone or at I-Power during office hours. Payment in full required to book your party.